Wheat grass, a grass similar to barley or oats, is grown across North America and is known to provide many amazing benefits to your health. Wheatgrass for juicing is grown indoors in trays and is made from wheat berries, which are harvested in about 7-10 days. Once harvested, wheatgrass is squeezed into a drink that has many active enzymes, nutrients, and minerals that improve your daily health. One ounce of wheatgrass has more protein than spinach, four times the amount of Vitamin E than broccoli, and many other nutrients essential for a healthy body. Today, we're going to take a look at 5 of the amazing health benefits included in one daily glass of wheatgrass juice. 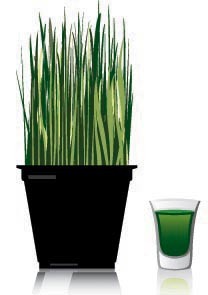 One major benefit of drinking wheatgrass juice is that it is high in chlorophyll, the green pigment of the plant. It is well known that wheatgrass is one of the best sources available to obtain this beneficial living chlorophyll as it is comprised of roughly 70%. Chlorophyll is known to destroy free radicals, improve the vascular system, and has benefits to the lungs and digestive system. Chlorophyll is of similar cellular structure to hemoglobin, which your body recognizes and in turn stimulates the synthesis of hemoglobin, which is blood-building in nature. The chlorophyll content in wheatgrass juice is one of the main contributors of the large amount of health benefits associated with the drink. Regular consumption of wheatgrass is known to help your body build a stronger immune system to fight off damaging infections and disease. The improvement in your immune system also enables your body to heal wounds faster and expel toxins and carcinogens that have built up in the body. Not only does wheatgrass juice improve your immune system but it develops an unfriendly atmosphere for bacteria growth. So in essence, your body improves its daily function while safeguarding and protecting itself from future bacterial growth. The active enzyme content in wheatgrass helps fight major health problems such as aiding in the prevention of cancer. Enzymes are essential to the overall health of our body and it is suggested that most people lack the required amount of enzymes our bodies require. This is due to our poor daily diets consisting of excessive amounts of processed and cooked foods. Enzymes are known to prevent cancer cells from hiding from your immune system, which is what occurs when cancer spreads throughout your body. Another health benefit realized through regular consumption of wheatgrass juice is its cleansing effect on the body; this detoxification effect is one of the many reasons people begin drinking the juice. The high content level of saponins in wheatgrass improves the function of your lymphatic system. This accelerates the removal of toxins from the cells in your body which detoxifies your body quickly and efficiently. Saponins are phytochemicals which are found in most vegetables and herbs and help aid your body in absorbing important minerals needed for proper function. The high amino acid content in wheatgrass is also extremely beneficial to your health. Wheatgrass has an abundance of amino acids, which are the building blocks required for your body to produce proteins. Protein found in meats and other foods need to be broken down into amino acids before your body can produce protein. The amino acid in wheatgrass juice is in the raw form and aid in the growth and repair of body tissues. They are also essential for blood clotting and cellular repair. The five substances listed here that make wheatgrass an essential part of your daily diet only brush the surface of the beneficial properties of this wonder drink. Other benefits that have been described by active users include stronger bones, lower blood pressure, improved digestion, lower cholesterol, and much more. The amazing health benefits from wheatgrass are abundant and can be produced by simply juicing your own fresh grown wheatgrass daily. Natalie Greggain is a blogger for Purely Juicers.